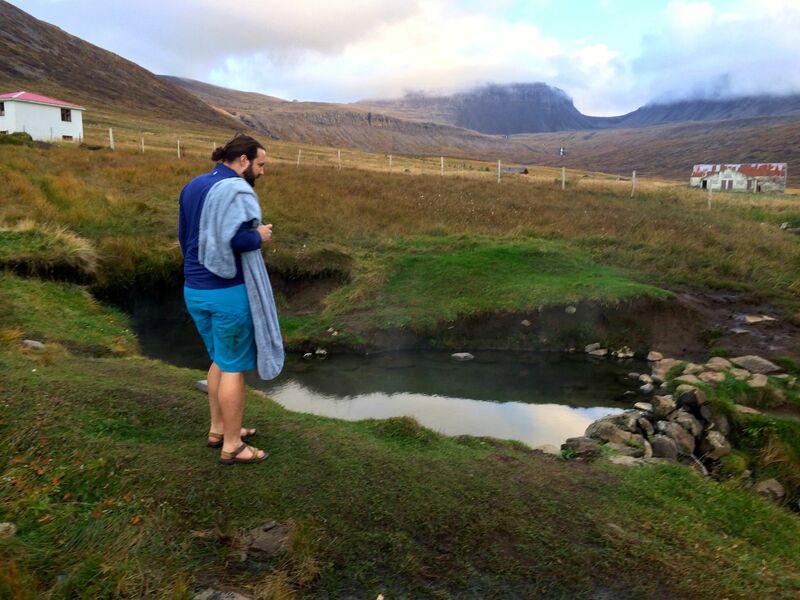 So far, I’ve posted about two other hot springs and pools in Iceland. One in Snaefellsnes and one in the Southeastern Westfjords. 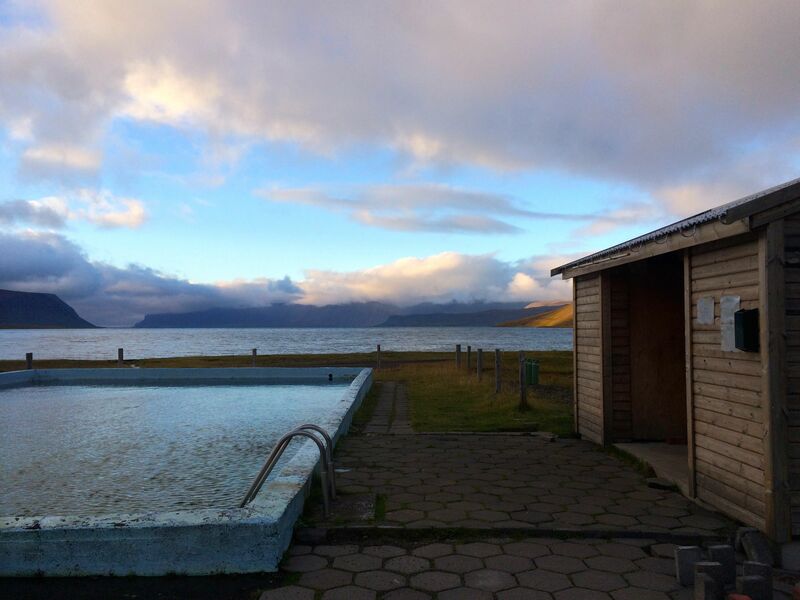 Today’s post is about a pool and hot spring in the southwest Westfjords region. We happened upon it completely by accident. We were simply making our way from Snaefellsnes peninsula, up and around the Westfjords before moving on into central Iceland. The Westfjords are simply gorgeous. never ending coastline and deep curves of land with rivers and tributaries and deltas. It’s a water-person’s dream. I took so many pictures! Anyway, towards the beginning of our journey around the Westfjords, we hit a bend in the road with water to our left and a few small buildings to our right; imagine our delight when we saw a big swimming pool right next to the road. We just had to pull in and check it out! Once we learned that it was a free public swimming pool all was right in the world. It may have looked slightly algae-covered, but it was naturally heated and looked so relaxing. Plus, the sign noted that there was a small natural hot spring up the bank a bit. This spring was what fed the pool, so naturally, the pool was cooler than the spring. Well, we just had to check out both spots and it was completely worth it! The pool and springs were completely free to use and there was a small building next to the pool to change and hang up your clothing. Although we were racing a setting sun and a driving destination for the day, we just could not pass up some time in some geothermal water. Nothing better to relieve aches and pains! What a fantastic place for a pool! As far as how to get here, to be honest, it took us about 30-40 minutes to figure out just where on the map it is when I was typing up this blog post. If you google pools in the Westfjords, one site states that this pool is located Reykjafjordur on the northeastern portion of the Westfjords. While it is located along “Reykjaforjdur”, if you simply type that location into Google Maps, you will be taken to the wrong location. 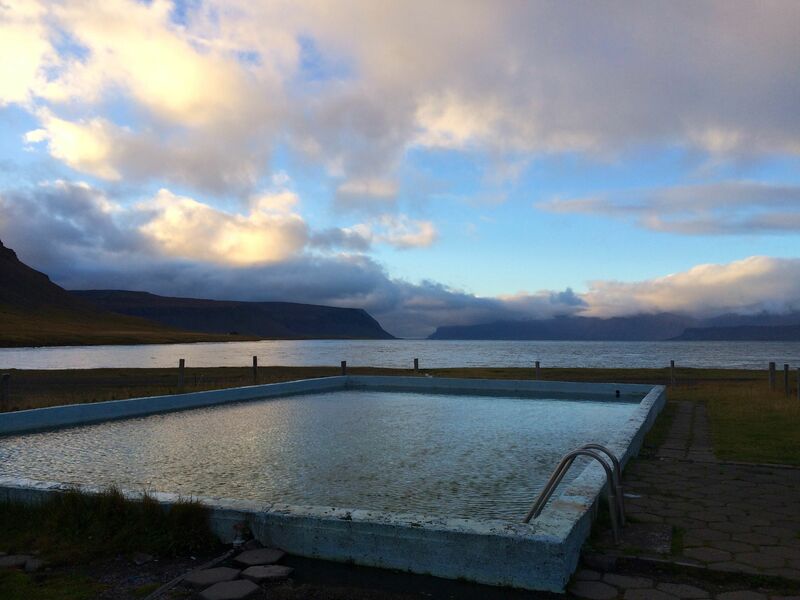 This pool is actually in the southeastern portion of the Westfjords. The best way to find it is to set up directions to the following GPS points (65.623635, -23.473685). This will take you to a point about 100 yards up the street from these pools. Alternatively, you can use the location “Bildudalsvegur” and that should also get you very close to the pools. Additionally, it’s worth noting that although our experience with pool was swimming in a bit of algae, I have read a multitude of posts and have seen a ton of pictures of the pool algae-free. It could be that because we visited in the more off-season, upkeep on the pool was not at 100%, but either way, I just wanted to be honest. If you have some irrational fear of algae in pools, you may not like this one! Below is a map with driving directions from Reykjavik. Per usual, I will again note the importance of getting out of Reykjavik to explore more of Iceland. Reykjavik is so awesome, but it is such a small part of Iceland. Rent a car!